Beggiatoa is a genus of bacteria in the order Thiotrichales. They are named after the Italian medic and botanist F.S. Beggiato. The organisms live in sulfur-rich environments. During his research in Anton de Bary’s laboratory of botany in 1887, Russian botanist Sergei Winogradsky found that Beggiatoa oxidized hydrogen sulfide (H2S) as an energy source, forming intracellular sulfur droplets. Winogradsky referred to this form of metabolism as inorgoxidation (oxidation of inorganic compounds). The finding represented the first discovery of lithotrophy. Up to now there is only one species of this genus known (Beggiatoa alba). Beggiatoa can be found in marine or freshwater environments. They can usually be found in habitats that have high levels of hydrogen sulfide. These environments include cold seeps, sulfur springs, sewage contaminated water, mud layers of lakes, and near deep hydrothermal vents. Beggiatoa can also be found in the rhizosphere of swamp plants. The colorless cells are disk-shaped or cylindrical, arranged in long filaments with a cell diameter that can measure between 12 and 160 micrometres (different subspecies). A massive central vacuole is used for accumulation of nitrate, presumably for use as an electron acceptor in anaerobic sulfide oxidation. 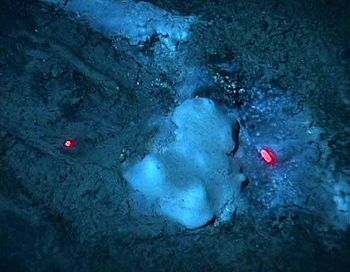 The filaments are surrounded by slime and can move by gliding. Beggiatoa can grow chemoorgano-heterotrophically by oxidizing organic compounds to carbon dioxide in the presence of oxygen, although high concentrations of oxygen can be a limiting factor. Organic compounds are also the carbon source for biosynthesis. Some species may oxidize hydrogen sulfide to elemental sulfur as a supplemental source of energy (facultatively litho-heterotroph). Produced sulfur is stored intracellularly. Some species have the ability of chemolitho-autotrophic growth by means of sulfide oxidation for energy and with carbon dioxide as a source of carbon for biosynthesis. In this metabolism internal stored nitrate is the electron acceptor and reduced to ammonia. Marine autotrophic Beggiatoa species are able to oxidize intracellular sulfur to sulfate. A frequently occurring mechanism when oxygen is lacking is reduction of elemental sulfur. Sulfur is reduced to sulfide at the cost of stored carbon or by added hydrogen gas. This may be a survival strategy to bridge periods without oxygen. Filaments have been observed to form dense mats on sediments in estuarine, shelf, seep, and deep-sea hydrothermal vent environments. They appear as a whitish layer and since they are present and flourish in marine environments which have been subject to pollution, they can be considered as an indicator species. Beggiatoa and other related filamentous bacteria can cause settling problems in sewage treatment plants, industrial waste lagoons in canning, paper pulping, brewing, milling, causing the phenomenon called "bulking". Beggiatoa are also able to detoxify hydrogen sulfide in soil. Beggiatoa are close relatives of Thioploca. Roxanne L. Nikolaus "Beggiatoa and hydrocarbon seeps - Unique bacteria thriving in a unique environment". ^ Trevisan, V. 1842. Prospetto della Flora Euganea. Coi Tipi Del Seminario, Padova, pp. 1-68. ^ Ljungdahl LG (2003). Biochemistry and physiology of anaerobic bacteria. Springer. p. 17. ISBN 978-0-387-95592-6. ^ Mukhopadhyaya PN, Deb C, Lahiri C, Roy P (Aug 2000). "A soxA gene, encoding a diheme cytochrome c, and a sox locus, essential for sulfur oxidation in a new sulfur lithotrophic bacterium". J Bacteriol. 182 (15): 4278–87. doi:10.1128/JB.182.15.4278-4287.2000. PMC 101942 . PMID 10894738. ^ a b c Ahmad A, Barry JP, Nelson DC (Jan 1999). "Phylogenetic affinity of a wide, vacuolate, nitrate-accumulating Beggiatoa sp. from Monterey Canyon, California, with Thioploca spp.". Appl Environ Microbiol. 65 (1): 270–7. PMC 91012 . PMID 9872789. ^ a b c Schmidt TM, Arieli B, Cohen Y, Padan E, Strohl WR (Dec 1987). "Sulfur metabolism in Beggiatoa alba". J Bacteriol. 169 (12): 5466–72. PMC 213973 . PMID 3316186. This page was last modified on 27 September 2016, at 05:55.